Old and new: Teachers and students work together in this year’s Kids Connect conference at the Cobb and Co Historical Museum. 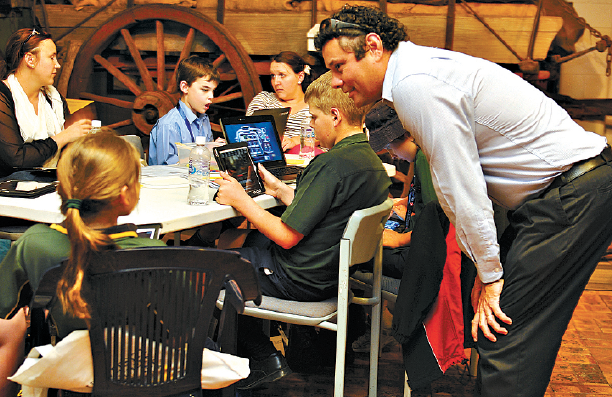 TECHNOLOGY old and new came together at this year’s Kids Connect conference held at Toowoomba’s Cobb and Co Historical Museum. About 120 students from 12 schools as far away as Quilpie, Chinchilla, Tara, Dalby and Millmerran attended. The conference, held on September 11 and 12, was a technology conference for kids, run by kids. Year 7 students from St Thomas More school organised the event, led by their teacher Tammy Banks. The theme for 2013, To History and Beyond, was apt given the choice of museum venue. Different skills were taught in various breakout groups. These included digital photography, digital videography, stop motion animation with Lego and toys, graphic design, film clip creation, lip dubbing, advertising, QR codes and computer game creation. A facilitator who created a special project for the students led each breakout group. The results of the students’ labours were viewed by an additional 230 parents and friends at a special presentation in the museum’s National Carriage Gallery at the end of the two days. A school spokesman said it was the second year Cobb and Co Historical Museum had hosted the event. “Our partnership looks healthy for the future,” he said.